Wesley Allen Hartley & The Traveling Trees are a country band based in Portland, Maine. Their debut album “Narrow Gauge Quad Trains” was recorded/released in December 2009 (w/Jonathan Donnell, Leslie Dean, Derek Reynolds) to good reviews by local newspapers, later to be named one of the top 10 local albums of 2010 by the Portland Phoenix. “Narrow Gauge Quad Trains” is currently under release by Burst & Bloom Records. In early spring of 2010 The Traveling Trees added the lap steel stylings of Gregg Hoover to their line-up and continued to evolve their sound. In late June, 2010 Wesley Allen Hartley & The Traveling Trees recorded their second album “Don’t Peel Your Bloomers Off Just Yet” currently self-released and available via shows/mail/online order. 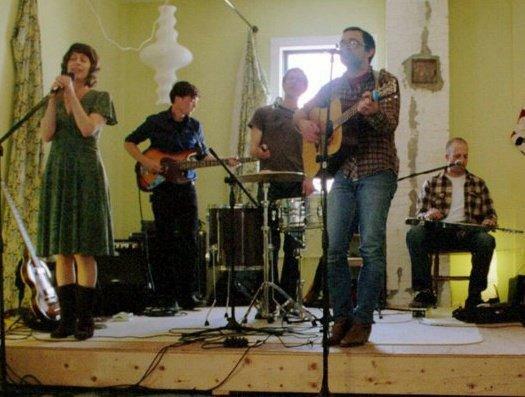 The Traveling Trees have played numerous shows and festivals from Maine to Texas. Up to date live listings are available on the Live/Tour tab.